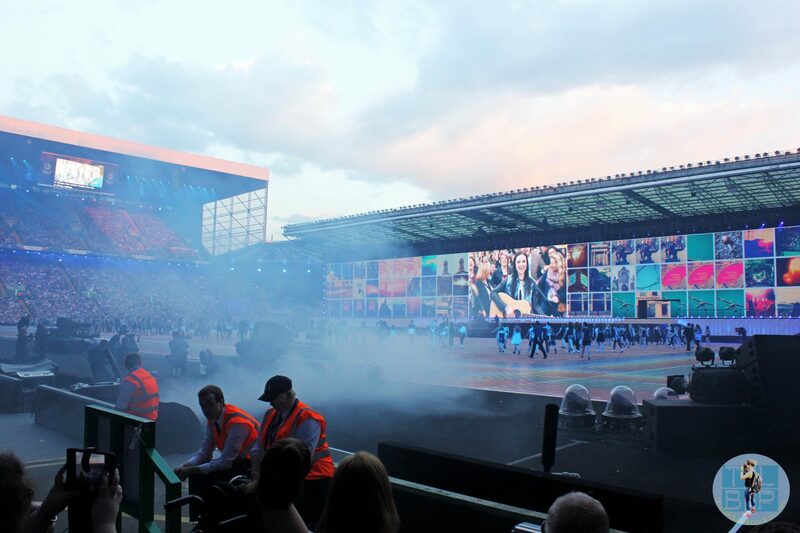 Last night along with thousands of others I made my way to Celtic Park as Glasgow prepared to welcome the world to its show. I wasn’t just any old spectator though, the Commonwealth Games are the entire reason I have been living in Glasgow for the past nine months. They are the topic of every breakfast and dinner with two out of three people in my household working there. I could probably tell you far more than the average person should know. So this night felt like a huge milestone, after tonight it’s all downhill. As I headed to Celtic Park on the train, with what felt like the rest of Scotland the sun was shining down on this beautiful city. No one could have forecast better weather for the occasion and as I stepped out of the station at Dalmarnock everything seemed to glisten in the light. The walk from the train station was long, past the Emirates Arena where queues began – mostly for ticket sales and collection. I carried on strolling weaving my way through the slow crowd, I was eager to get inside and soak up the atmosphere. As I neared Celtic Park I noticed noise and what seem to be a band playing outside, on closer observation it wasn’t a band but a protest and a large one at that. I’m afraid I didn’t pay much attention but know it was something to do with Sri Lanka – who I didn’t even think were part of the commonwealth but obviously I was wrong as I later found out. Checking my ticket for which entrance I needed – west – it wasn’t long then before I was walking through the snaked path towards the entrance where I was greeted by airport security style scanners manned by the army. It was all very official but fast and efficient at the same time. 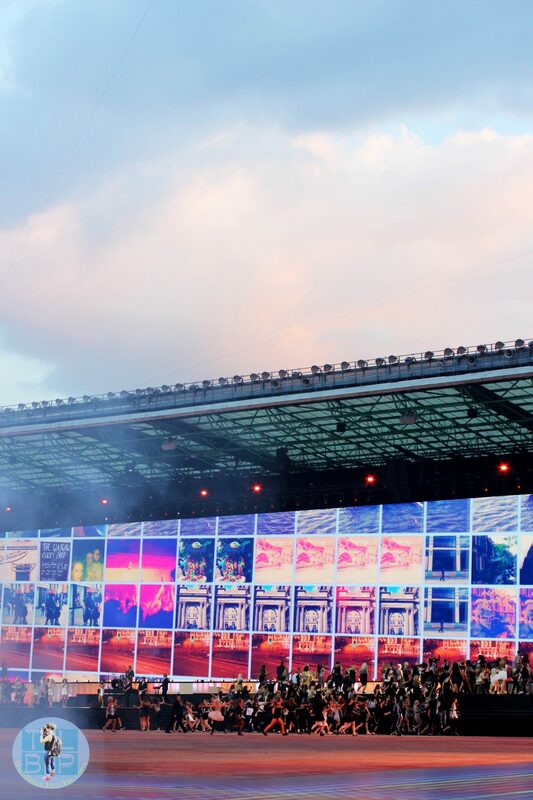 I was however surprised that no one had asked to see my ticket by this point – you could technically have gotten in to Celtic Park grounds without a ticket! Straight inside the west gate was the One Show set up and my boyfriend’s ‘office’ the logistics compound. As he continually tells me they move tables and chairs but I know and have seen they do a lot more than that! I had a chat with the guys before being given a free program, marker pen and pointed in the direction of Kelly Holmes and Iwan Thomas. They were doing an interview in the middle of Celtic Park and surprisingly they didn’t have much of a crowd. I caught the end of it before waiting – not very long – to get Kelly’s autograph on my program. I then stood watching the One Show until 8pm, managing to stand just behind Amy McDonald while she was singing at the end and yes you guessed it – I made it on TV! I was aware my ticket said be seated by 8pm so 10 minutes later I made a dash for my seat, collecting my brother on the way. Once we entered the stadium, we were told there was a problem with our seats. Something to do with them being given away as accessibility seats. I was a little confused and we were taken from one person to another trying to find out where we had been relocated too. I wasn’t too fussed we were now stood on ground level and able to admire the stage and crowd rather well. After 5 minutes we were shown to a seat on the second row back from the ground level. To me this seemed like an upgrade considering I had only purchased £40 tickets but then being a little higher up and getting a more overall view may have been better. The build up was a lot longer than I anticipated, with some Scottish comedian presenting the build up (apologies I cannot remember his name) for an hour. 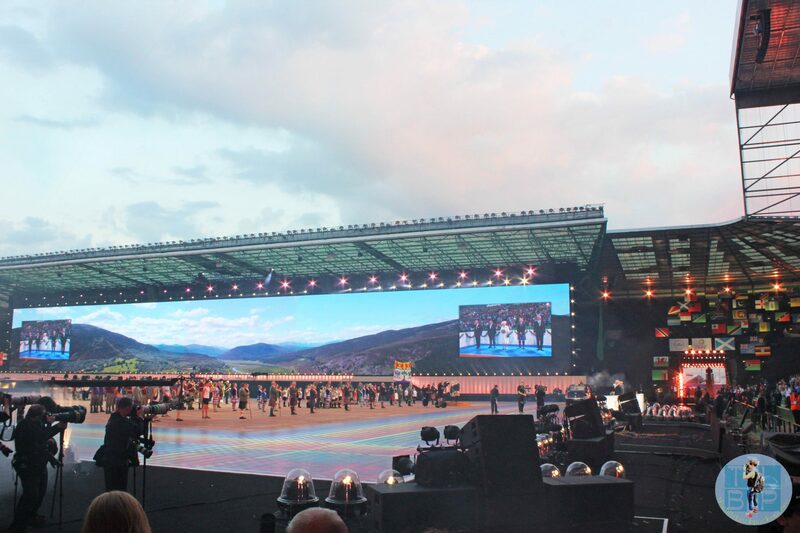 There was me thinking it was going to start at 20:14… to be honest they did a good job of warming the crowd up and it was just nice soaking up the atmosphere inside the stadium. 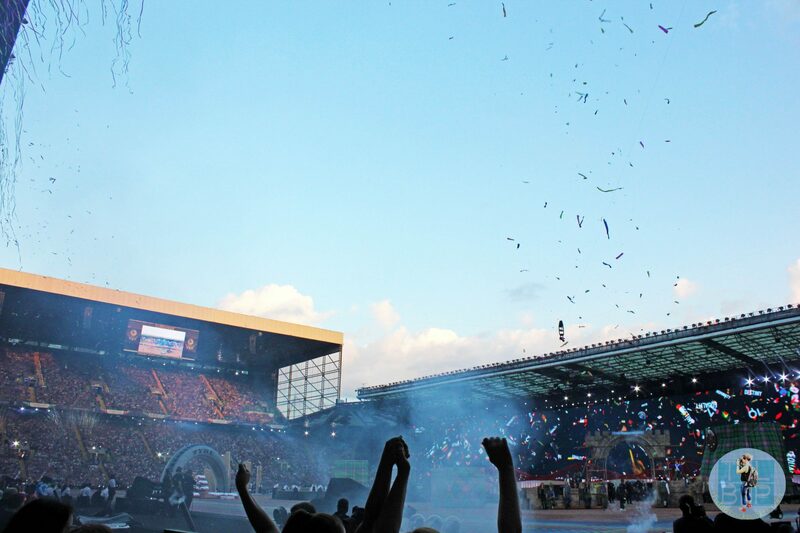 The show started around 9pm, with streamers pouring over the stadium and all sorts of quirky ‘Scottish’ things going on in the middle. From the ground level I didn’t feel like I had a huge overall view of this part. However it was fun watching them take apart and get rid of all the props once they had been used – it all seemed very slick. As this section was coming to an end I flicked on to twitter to see my feed full of people complaining about how embarrassing it was – will be watching that back on Iplayer and seeing for myself later. 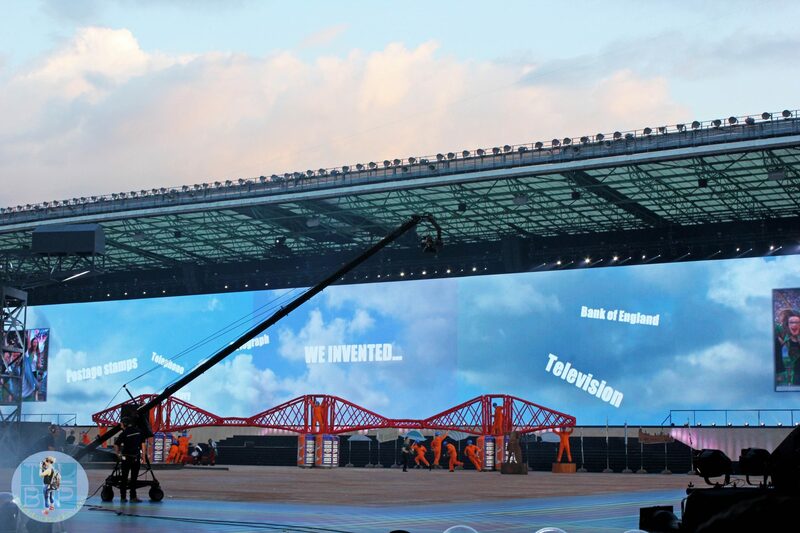 I think one of the coolest parts was the HUGE screen they had set up along an entire side of the stadium. 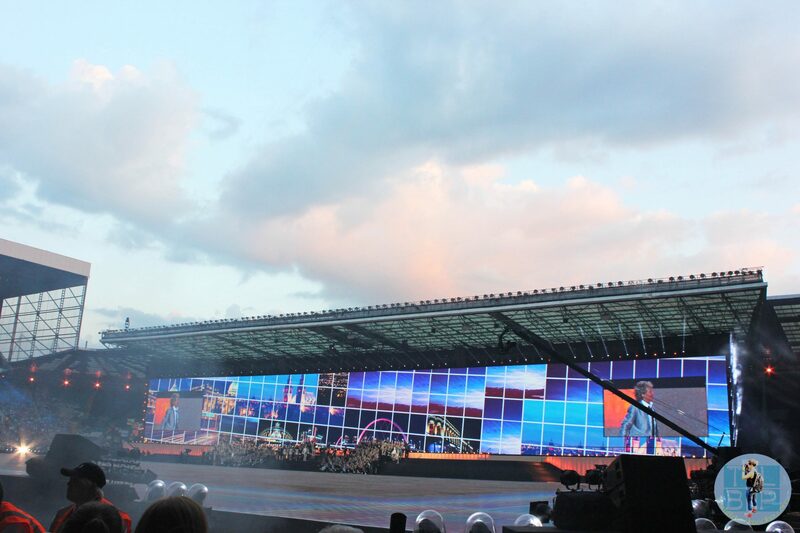 They really used that to make the show and even from ground level I could see it pretty well. I though Amy McDonald did an amazing job and the video they had made in the city was awesome. I’ve never been a Rod fan but it was pretty cool seeing him there all the same. The show feels like it passed by in a blur and I cannot wait to watch it back and see what I missed. Although I remember sitting in my seat during the athletes parade and willing for it to hurry up, the parade always seems to take the longest and my is it hard to keep motivated to cheer for that long! I did enjoy the music they played during this time, some of the countries uniforms and spotting which commonwealth countries I’d been too. 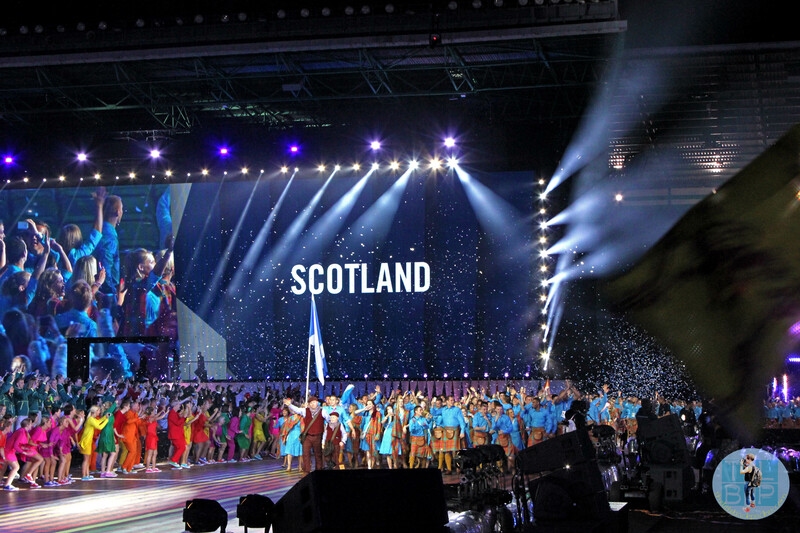 The stadium erupted when Scotland entered, as you would imagine and the crowd felt like it was back to life again. 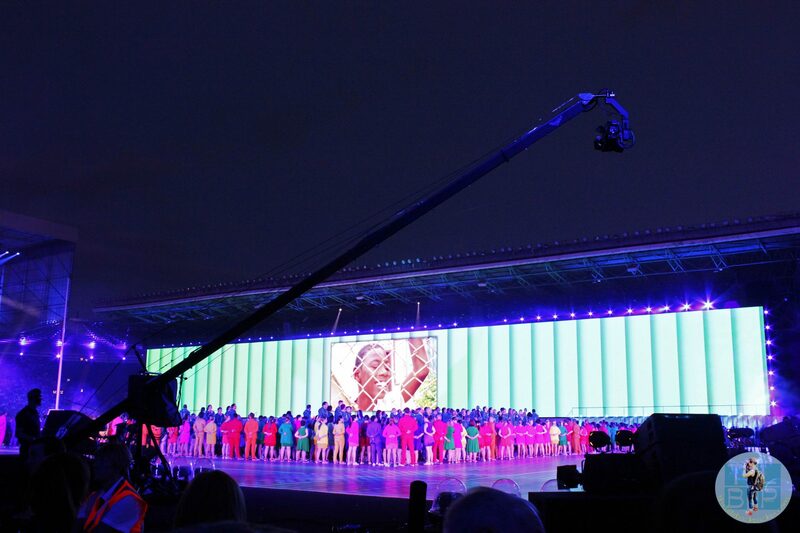 I had mixed feelings about the UNICEF features all the way through but it is obviously for an amazing cause and watching the stadium light up as everyone donated their £5 was pretty magical – I even donated because it really felt like you were being part of something great. We had all been making guesses on the baton relay carrier and as it made its way in to the stadium we were waiting with our eyes peeled. 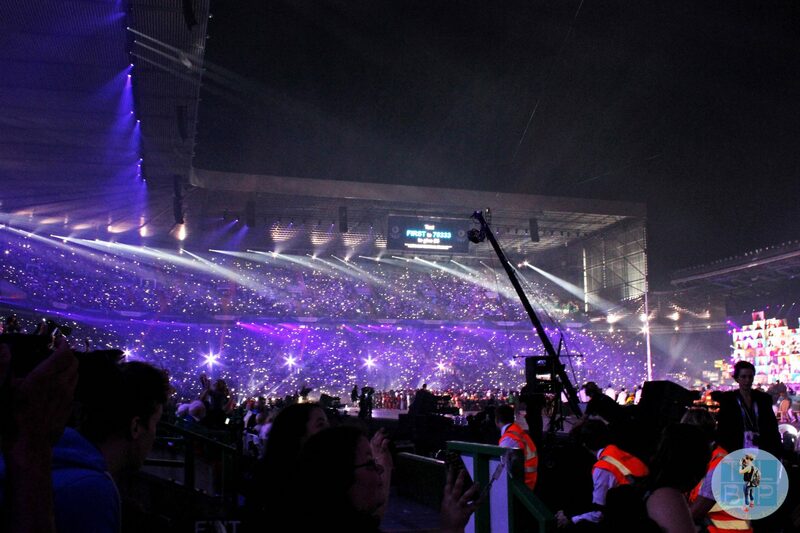 Of course we had gotten it right: Sir Chris Hoy carried it through the crowd towards the royal box and the Queen. 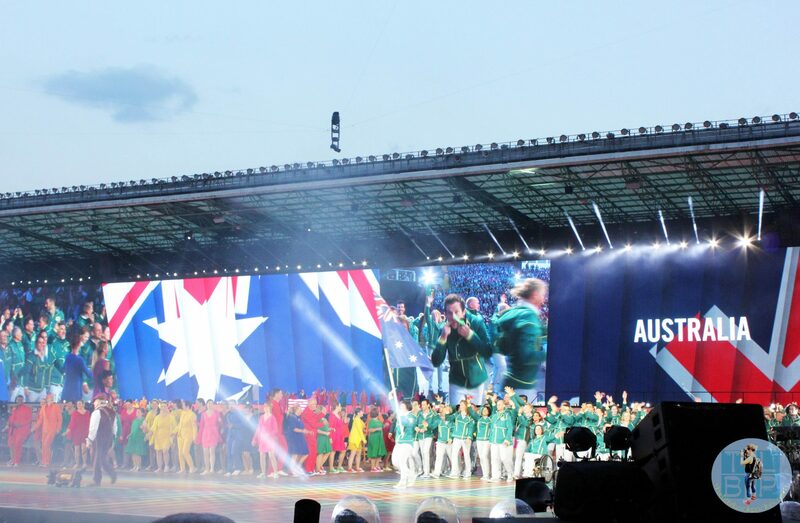 We all had a huge giggle as they struggled to open the baton and once all the speeches were done, once again the crowd erupted as the games were declared open. I’m aware this is going on a bit, so lets wrap it up: The atmosphere inside the stadium was so much fun and the crowd really got behind the shouting and cheering. I will be interested to see how tacky and embarrassing the first section looks on TV, but then when London 2012 is still fresh in people’s minds I feel like bad press was always going to happen. 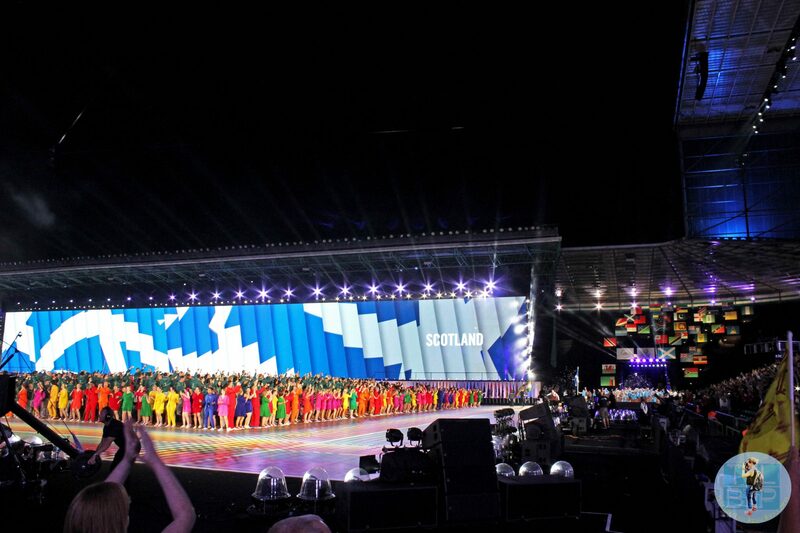 The music – although I was hoping for more acts – was brilliant, from singers to violin players it wasn’t just a pop culture overload, they kept it true to Scotland. The ballet I didn’t see much of from the ground level but that certainly seemed like a beautiful moment. 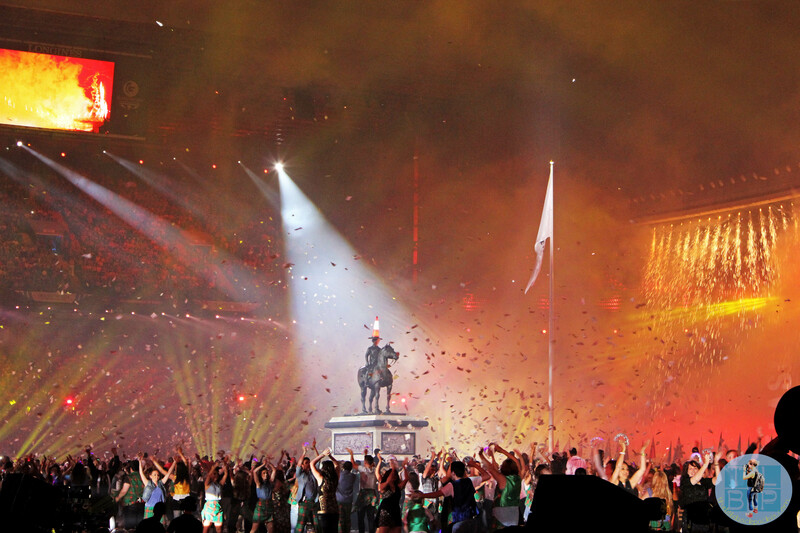 The athletes parade always gets the stick for being so long but if all countries had the energy and enthusiasm that Australia do then I’m there would be less moaning – they were honestly the happiest nation to walk in and really looked like they were loving life. My ticket purchase may have been quite last minute, but I’m throughly glad I bothered to purchase a ticket. 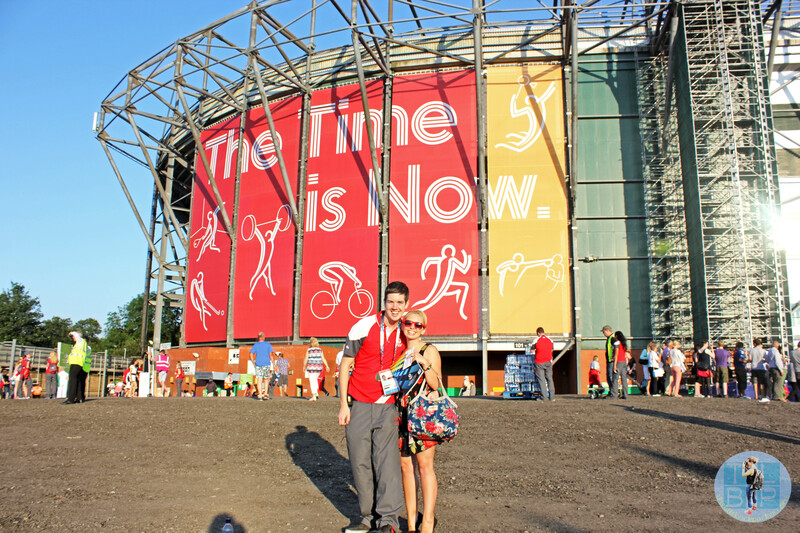 I had a fantastic time sat inside the stadium last night and cannot wait to see the sport for the next 10 days! They certainly put on quite a show! I’m very jealous that you were able to go!